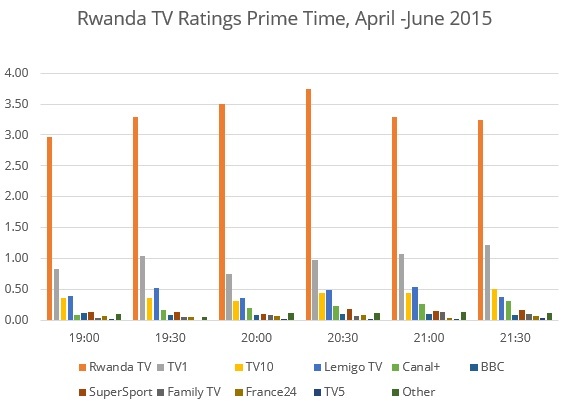 Using the daily data collected through GeoPoll’s Media Measurement Service, GeoPoll has analyzed the top TV stations in Rwanda for Q2 2015, April 1st – June 30th. 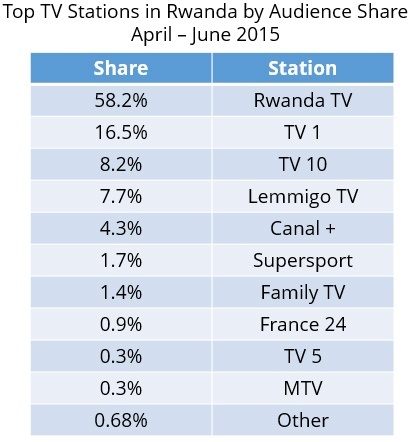 We examined both ratings* and share** for the top stations in Rwanda. The below chart shows the average ratings for the top 10 stations during prime time from 19:00 to 21:30. Rwanda TV dominates the Rwandan TV market while TV1 comes in a distant second, experiencing its highest peak between 20:30 to 21:30. Rwanda TV was for a long time the only TV station in the country and has managed to retain its core audience. Due to the limited number of TV stations in Rwanda, 60% of the top stations are international stations, including Canal+, France24 and BBC.